The Martin PBM Mariner was a patrol bomber flying boat of World War II and the early Cold War period. It was designed to complement the PBY Catalina in service. 1,366 were built, with the first example flying on February 18, 1939 and the type entering service in September 1940. 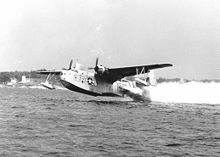 In 1937, the Glenn L. Martin Company designed a new twin engined flying boat to succeed its earlier Martin P3M and supplement the Consolidated PBY, the Model 162. It received an order for a single prototype XPBM-1 on 30 June 1937. This was followed by an initial production order for 21 PBM-1 aircraft on 28 December 1937. To test the PBM's layout, Martin built a ⅜ scale flying model, the Martin 162A Tadpole Clipper with a crew of one and powered by a single 120 hp (90 kW) Chevrolet engine, this flying in December 1937. The first genuine PBM, the XPBM-1, flew on 18 February 1939. The aircraft was fitted with five gun turrets and bomb bays that were in the engine nacelles. The gull wing was of cantilever design, and featured clean aerodynamics with an unbraced twin tail. The PBM-1 was equipped with retractable wing landing floats that were hinged inboard, like the Catalina. The PBM-3 had fixed floats, and the fuselage was three feet longer than that of the PBM-1. The first PBM-1s entered service with Patrol Squadron FIFTY-FIVE (VP-55) of the United States Navy on 1 September 1940. Prior to the outbreak of World War II, PBMs were used (together with PBYs) to carry out Neutrality Patrols in the Atlantic, including operations from Iceland. Following the Japanese Attack on Pearl Harbor, PBMs were used on anti-submarine patrols, sinking their first German U-Boat, U-158 on 30 June 1942. In total, PBMs were responsible, wholly or in part, for sinking 10 U-Boats during World War II. PBMs were also heavily used in the Pacific, operating from bases at Saipan, Okinawa, Iwo Jima and the South-West Pacific. The United States Coast Guard acquired 27 Martin PBM-3 aircraft during the first half of 1943. In late 1944, the service acquired 41 PBM-5 models and more were delivered in the latter half of 1945. Ten were still in service in 1955, although all were gone from the active Coast Guard inventory by 1958 when the last example was released from CGAS San Diego and returned to the US Navy. These flying boats became the backbone of the long-range aerial search and rescue efforts of the Coast Guard in the early post-war years until supplanted by the P5M the HU-16 Albatross in the mid-1950s. PBMs continued in service with the US Navy following the end of World War II, flying long patrol missions during the Korean War. It continued in front-line use until replaced by its direct development, the P5M Marlin, with the last USN squadron equipped with the PBM, Patrol Squadron FIFTY (VP-50), retiring them in July 1956. The British Royal Air Force acquired 32 Mariners, but they were not used operationally, with some returned to the United States Navy. A further twelve PBM-3Rs were transferred to the Royal Australian Air Force for transporting troops and cargo. The Royal Netherlands Navy acquired 17 PBM-5A Mariners at the end of 1955 for service in Netherlands New Guinea. 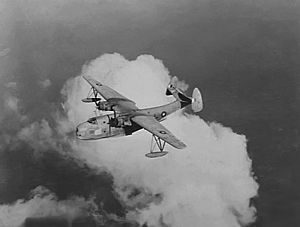 The PBM-5A was an amphibian plane with retractable landing gear. The engines were 2,100 hp (1,566 kW) Pratt & Whitney R-2800-34. After a series of crashes, the Dutch withdrew their remaining aircraft from use in December 1959. Prototype. Powered by two 1,600 hp (1,194 kW) R-2600-6 engines. Initial production version. 5x— .50 inch (12.7 mm) machine guns. Two R-2600-6 engines. 21 built. Conversion of one PBM-1 as experimental catapult launched long range strategic bomber. Improved version. 1,700 hp (1,270 kW) R-2600-12 engines. 32 built. Unarmed transport version of PBM-3. 18 new build plus 31 converted from PBM-3. Improved patrol version with twin .50 in machine guns in nose and dorsal turrets, and single guns in tail turret and waist positions. AN/APS-15 radar in radome behind cockpit. 274 built. Designation for ex-RAF Mariner GR.1A after return to US Navy. Dedicated anti-submarine aircraft with reduced armament (2x— fixed 0.50 in machine guns in nose, single machine gun in port waist position and single gun in tail turret) and increased range. 94 built as new plus 62 conversions. Patrol bomber with increased power (two 1,900 hp (1,417 kW) R-2600-22s) and increased armament (twin 0.50 machine guns in nose, dorsa and tail turrets, plus two waist guns. 259 built. Proposed version with two 2,700 hp (2,015 kW) Wright R-3350 engines. Unbuilt. Version with 2,100 hp (1,566 kW) Pratt &amp; Whitney R-2800 engines. 628 built. PBM-5E Variant of PBM-5 with improved radar. PBM-5S Lightened anti-submarine variant of PBM-5. PBM-5S2 Improved anti-submarine aircraft with revised radar installation. PBM-5A (Model 162G) Amphibian version of PBM-5, with retractable nosewheel undercarriage. 36 built plus 4 conversions. Mariner I British designation for 32 PBM-3B supplied to the Royal Air Force. Picture - A US Coast Guard PBM takes off from the water assisted by RATO. Argentine Navy purchased nine PBMs during the 1950s for the Argentine Naval Aviation, retiring its last Mariner in May 1962. VSQ 321 based at Biak Air Base, Dutch New Guinea operated 15 PBM-5A between 1955 and 1960 after the retirement of their PBY's. Royal Air Force ordered 33 aircraft but only 28 were delivered. 524 Squadron operated 28 Mariner Is from October-December 1943 under command of No. 15 Group Coastal Command. National Navy of Uruguay purchased three PBM-5S2s in 1956, with the last retired on 3 February 1964. United States Navy PBM-5A (Bureau Number (BuNo) 122071) is the only surviving Mariner. It is on loan from the National Air & Space Museum at Washington D.C., and is on display at the Pima Air & Space Museum in Tucson, Arizona. Operated by the USN between 1948 and 1956, it is is painted in the marking of Transport Squadron 21 (VR-21) and coded RZ 051 of the early 1950s. Although only one complete Mariner aircraft exists another aircraft (PBM-5 59172) lies upside down under Lake Washington. It crashed on 6 May 1949 and after a number unsuccesfull attempts to recover the wreck over the following decades it is now used as a training site for divers. The Model 162A (registered NX19168), the piloted quarter scale test aircraft, is on display at the Baltimore Museum of Industry. United States Navy PBM-5 (BuNo 59225) based at Naval Air Station Banana River, Florida was destroyed in a mid-air explosion in December 1945 off the coast of Florida near the Bahamas while searching for the missing TBF Avengers of Flight 19 from Naval Air Station Fort Lauderdale, Florida. A US Navy PBM-5 crashed on Thurston Island, Antarctica on December 30, 1946 while supporting Operation Highjump. On November 30, 1944 a US Navy PBM-5 crashed into Mount Tamalpais in Northern California killing 8 Naval Aviators and Naval Aircrewmen. The plane had taken off from Naval Air Station Alameda and was part of a larger flight headed for Hawaii when it developed engine trouble shortly after take-off. Donald, David (editor). American Warplanes of World War II. London:Aerospace Publishing, 1995. ISBN 1 874023 72 7. Dorr, Robert F. "Variant Briefing: Martin Flying Boats: Mariner, Mars and Marlin". Wings of Fame. Volume 7. London:Aerospace Publishing, 1997. pp.114-133. ISBN 1 874023 97 2. Green, William. War Planes of the Second World War: Volume Five Flying Boats. London:Macdonald, 1968. ISBN 0 356 01449 5. Hoffman, Richard A. "Dutch Mariners: PBMs in Service with the Netherlands Navy". Air Enthusiast, No.97, January/February 2002. Stamford, UK:Key Publishing. pp.73-77. ISSN 0143 5450. Hoffman, Richard A. "South American Mariners:Martin PBMs in Argentina and Uruguay". Air Enthusiast, No. 104, March/April 2003. Stamford, UK:Key Publishing. pp.29-33.ISSN 0143 5450. Jefford, C G. RAF Squadrons, first edition 1988, Airlife Publishing, UK, ISBN 1 85310 053 6. March, Daniel J. British Warplanes of World War II. London:Aerospace Publishing, 1998. ISBN 1 874023 92 1. Roberts, Michael D. Dictionary of American Naval Aviation Squadrons: Volume 2: The History of VP, VPB, VP(HL) and VP(AM) Squadrons. Washington DC: Naval Historical Center, 2000. Swanborough, Gordon and Peter M. Bowers. United States Navy Aircraft since 1911. London:Putnam, 1976. ISBN 0 370 10054 9. Martin PBM Mariner Pictures and Martin PBM Mariner for Sale.